Welcome to Fresca Cafe where we take pride in using the freshest ingredients to make sandwiches, salads and our one of a kind gelato. Our gelato and sorbettos are homemade and blended daily, sourced from the freshest seasonal and local fruits, and imported Italian ingredients, there is a flavor for everyone to enjoy! It has always been my dream to open up a Gelatoria and now my dreams are coming true with my wife, Francesca. Both born and raised in New York, when the streets of Queens became too crowded we decided to move to a community where we knew we would be welcomed with gratitude and open arms, Prescott, AZ. Now we are bringing our Sicilian heritage and New York flair to the city of Prescott. From our family to yours, thank you for joining us at Fresca’s and welcome to our family. After we visited my sister Rosa, who owns Rosa's Pizzeria and Fine Italian Restaurant, we fell in love with the town and moved to Prescott. Upholding Our Family tradition of serving Authentic Imported Italian foods and dishes, adds to the quality of life that Prescott is known for. 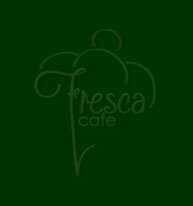 For Daily Specials, Pictures, What's New at Fresca Cafe and Comments, Click on Facebook button.